When generating multiple initial geometries or velocities, it is good practice to check that we are sampling in the correct way, i.e that we are uniformily sampling from the distribution we expect or desire to sample from. In this post I will show an example where the Kolmogorov-Smirnov test (KS-test) is used to check that velocities are sampled uniformily from the Maxwell-Boltzmann distribution function. When the distributions match, as n tends to infinity, the distance should tend to zero. Depending on how large this difference is respect to a critical value, one can establish whether their data was sampled from the continuous distribution. We have found D < therefore the test confirms the fact that our data’s distribution is the Maxwell-Boltzmann distribution. In Fig. 1, the minimized structure of each molecule is shown. In Fig. 2, a set of randomly rotated structures of the molecules of Fig. 1 is shown. Fig 2: Two sets of rotated molecules. 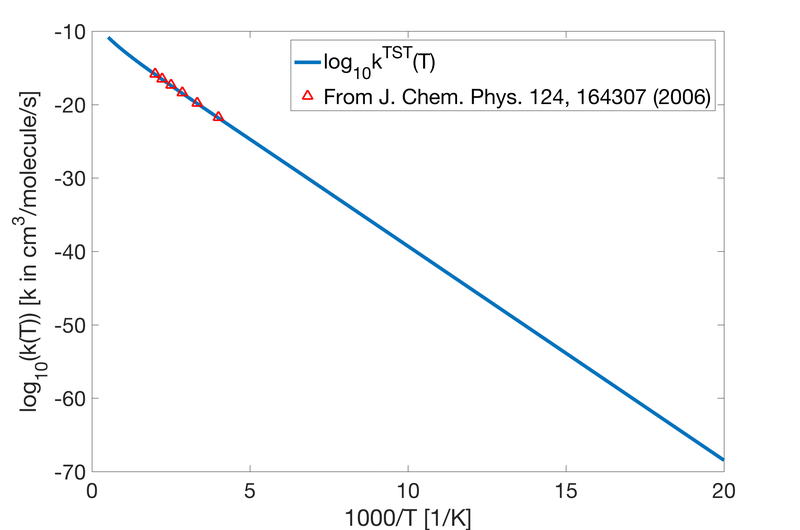 The molecules from Fig 1 were all randomly rotated and are shown here in the same plot. With these initial positions and by defining some initial atomic velocities we can run dynamics for bimolecular collisions. Here this was done using TeraChem (http://www.petachem.com/). In the first video here below, I show a set of multiple trajectories (each of these was run separately) where the molecules collide at 300K. In the second video a single trajectory is shown. From this we can see that the angle at which reactants approach is an important variable in determining whether a reaction will occur. In fact for this trajectory no reaction occurs. In theoretical chemistry we often simulate dynamics by propagating trajectories on potential energy surfaces. From these trajectories one can derive, e.g. a reaction rate constant. For each trajectories, initial conditions, i.e velocities and coordinates, need to be defined for the molecules. 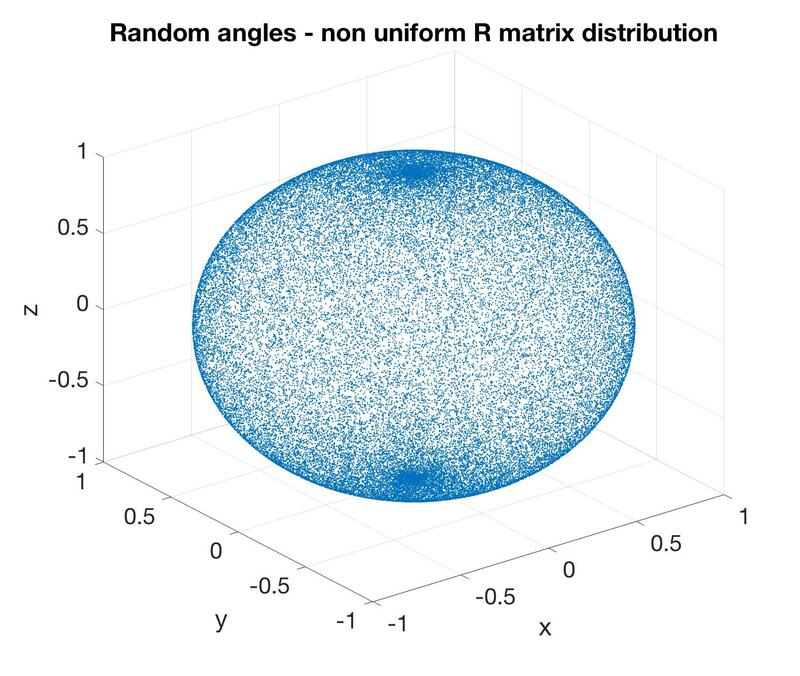 One interesting part of the process is defining uniformly distributed random rotations in three dimensions (uniform distribution on SO(3)). In fact usually we want to give the molecules a random rotation. For a detailed theoretical description of this, please see e.g. Ref . We can see a higher density of points around the north and south poles. This happens because in three dimensions, the Haar measure of a matrix R in SO(3) can be written as . The cosine term is fundamental. If we do not take it into account when sampling , as we get closer to the poles, circles have a smaller circumference than near the equator thus if the angle is sampled uniformly one gets more rotations in those locations (see e.g. Ref. ). Now we can apply this to a molecule and generate uniformly distributed rotations. I will show an image of this in the next post! David Kirk, Graphic Gems III, San Diego: Academic Press Professional (1992). John T. Kent and Asaad M. Ganeiber: Simulation of random rotation matrices, Events and Meetings of Italian Statistical Society, 46th scientific meeting of the Italian statistical society (2012). 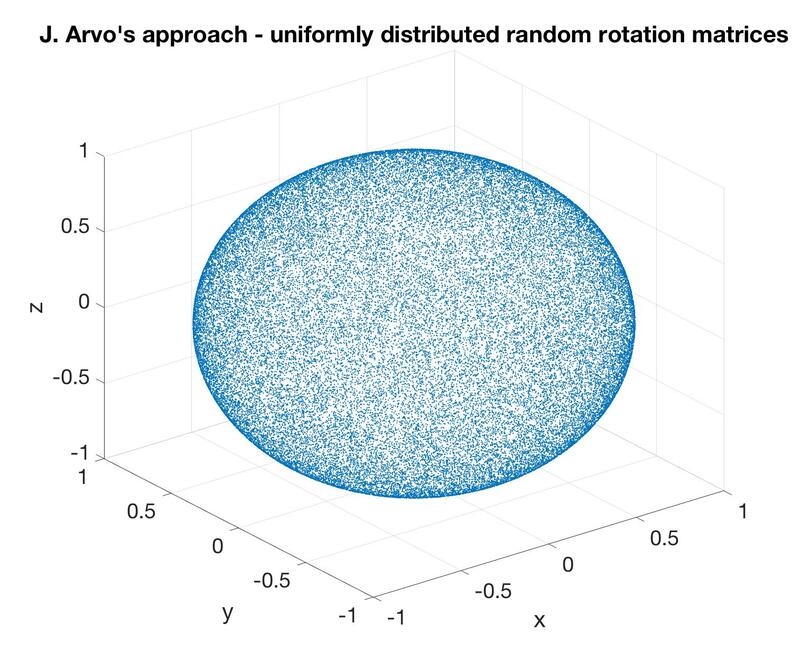 James Arvo, Fast random rotation matrices, Graphics Gems III, p117-120 (2012). Nudged Elastic Band (NEB) is a method which can be used to find the minimum energy path (MEP) and the transition state which connects reactants to products. Reactants and products are considered in their local minima and their states need to be provided by the user. The algorithm works as following. A set of images (i.e a specific geometric configuration of the atoms) connecting the initial (reactant) and final (product) states are linearly interpolated. Each image is connected to the other by a spring. Then, the energy of this string of images is minimized. The perpendicular component of the spring force is removed to avoid interference with relaxation to the MEP when minimizing. If the minimization converges, one obtains a guess of the minimum energy path. For example, for the reaction, the blue images (see below) would be interpolations between start and end geometries. During minimization the intermediate configurations will change until the MEP is found. Here I will describe how to write input files to submit an NEB calculation using TeraChem (http://www.petachem.com/products.html). To begin one minimizes the reactant and products to get a converged geometry in their local minima. The main difference is the keyword ts_method used to select the NEB method with frozen end points. When the algorithm converges, the TS optimized geometry can be found in the optim.xyz file of the scr/ directory. To run reaction dynamics or compute reaction rate constants ab-initio, one needs a potential energy surface. In the case of transition state theory the minimum energy path needs to be identified and computed and subsequently the transition state needs to be determined. If the transition state is known then the full path need not be determined to implement TST. The computation of a full potential energy surface is generally time-consuming and complex. Therefore, methods have been developed to try to interpolate between known fixed geometries to compute an energy pathway while avoiding to compute the full potential energy surface. These include the Nudge Elastic Band method (NEB) , the String Method , the Growing String Method (GSM), the Freezing String Method (FSM) . In the next post I will describe how to implement the NEB method for a reaction. G. Henkelman and H. Jónsson, J. Chem. Phys. 113, 9901-9904 (2000). The main role of the temperature dependence is in the exponential, this is why we see a linear dependence of the logarithm of the rate. Further, as expected the rate increases as temperature rises (i.e in the limit of the x axis going to zero) and decreases at lower temperatures. When quantum effects are included, one might see a large change at low temperatures which is due to the presence of tunneling. Other differences arise from the fact that the rate as is comes from a static picture and no dynamics has been carried out.